All home bouts are held at Arnold Cypress Park (8611 Watson Cypress CA). Doors open at 6pm. First whistle at 7pm. Badfish Roller Derby is back at it again! This time we are up against our friends, local team ..High Tide Roller Derby. Discounted tickets only available online here till 11:59 pm on 06/01/18, after then tickets can be purchased at the door starting at 6:00 pm. 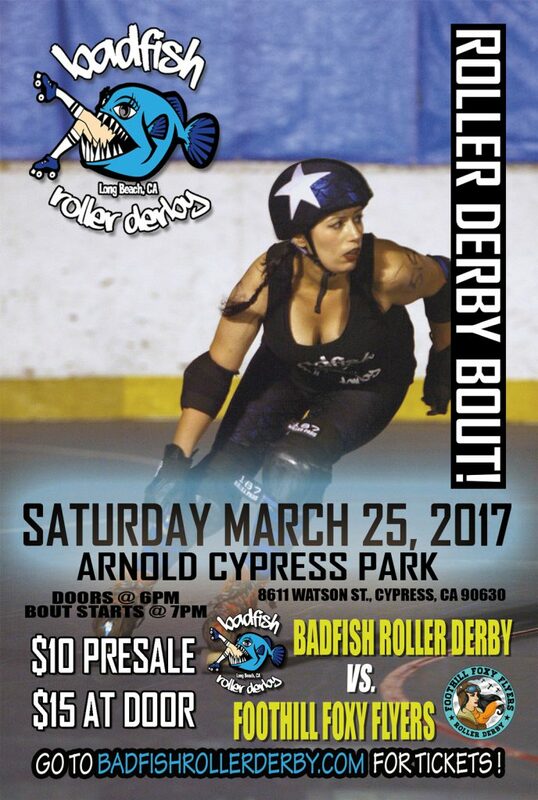 Badfish Roller Derby of Long Beach is a competitive flat track roller derby league located in sunny Southern California. 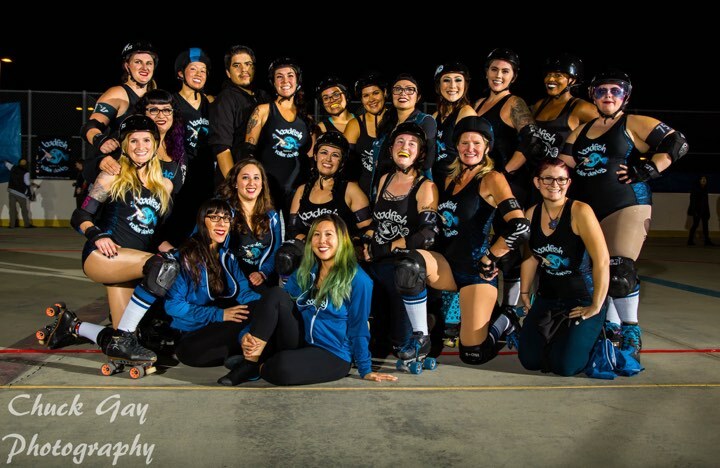 The league was established in 2014 and is ready to take on our 4th skating season with bouts lined up! We are a determined group of individuals that are dedicated to playing the sport of roller derby, as well as being a positive and active part of the community. 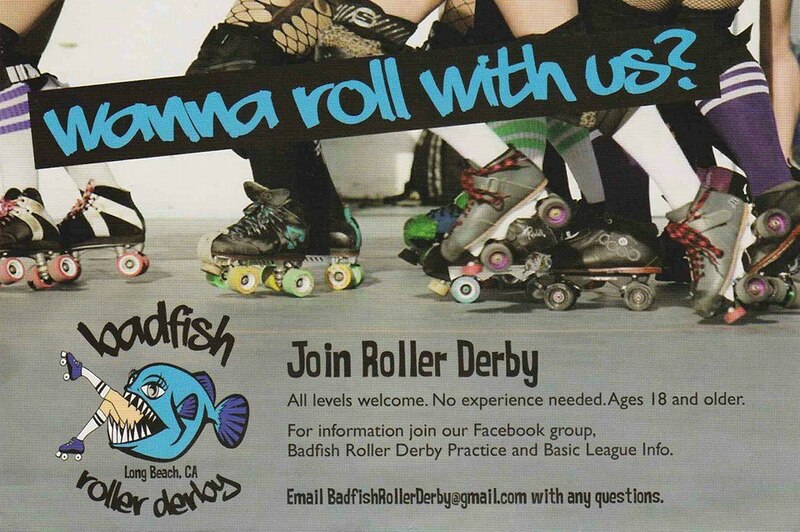 Badfish is always recruiting skaters, referees and volunteers to be a part of our fierce but lovely league. We LOVE a packed rink when it is bout time, so check out our calendar and keep an eye out for our presale tickets for our next bout! Badfish Roller Derby is back at it again! Join us for our upcoming home bout against Foothill Foxy Flyers, where we will battle it out for bragging rights. Doors open at 6:00 PM, game starts at 7:00 PM. Click here to view our 2017 bout schedule. 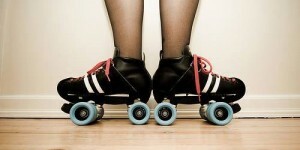 Have you ever wanted to play roller derby??!! Here is your chance! 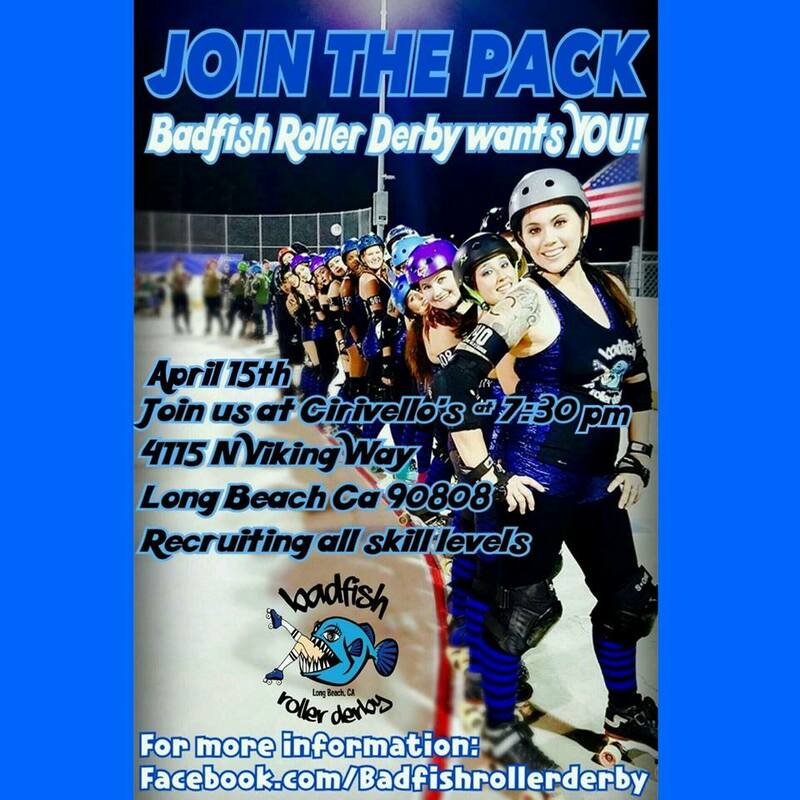 Badfish will be hosting a recruitment practice on March 9th at 7:30pm. 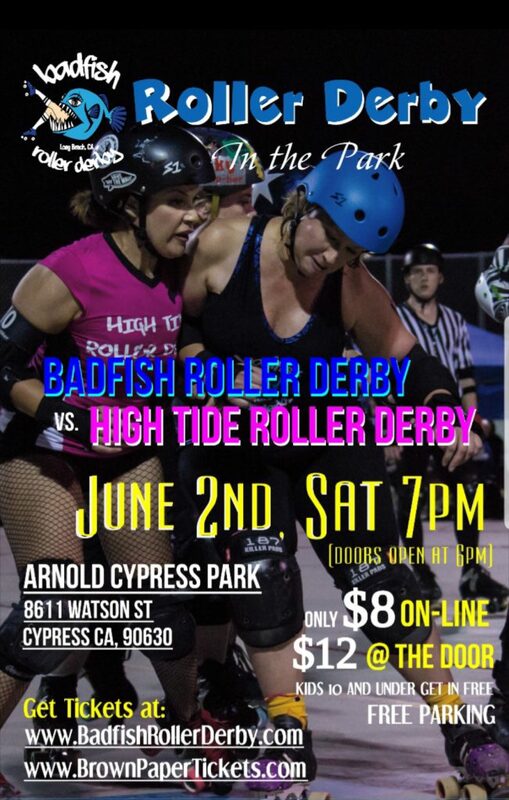 Come out to Arnold Cypress Park (near Long Beach and Orange County) and check out the Badfish skaters in action! There will be a Q&A to get the scoop on how to become a Badfish too!! *Women and men interested in volunteer work or becoming non-skating officials and referees. ALL SKILL LEVELS-EVEN BEGINNERS WITH ZERO SKATING EXPERIENCE ARE WELCOME. We will teach you to skate!! Click here for more info and ask us questions on Facebook. 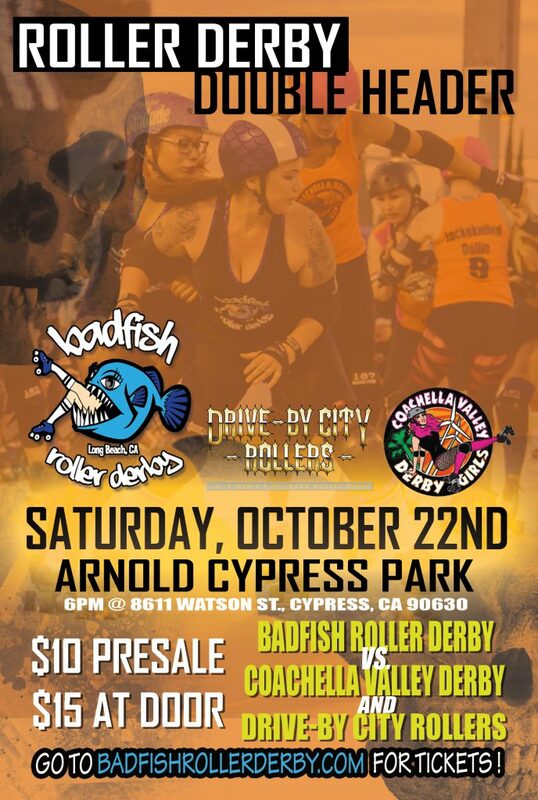 Up first for the night will be Game 1, Badfish Roller Derby Vs Coachella Valley Derby Girls ………. Game 2. Drive By City Rollers (All Mens league) teams up with the skaters from Badfish for a Black and white Co-Ed bout against each other. Doors open at 5:30 PM, Game 1 starts at 6:00 PM. Discounted tickets only available online here till 11:30pm on 10/21/16 after that tickets can only be purchased at the door. To learn more about Badfish Roller Derby or to join, visit us at www.BadfishRollerDerby.com and go “Like” us on Facebook! Badfish Roller Derby is back at it again! Join us for our upcoming home bout against Hidden City Derby Girls, where we will battle it out for bragging rights. Get your tickets now at Brown Paper Tickets! Discounted tickets only available online at http://www.brownpapertickets.com/event/2597171 till 11:59 pm 09/23/16. After that tickets will only be available at the door. 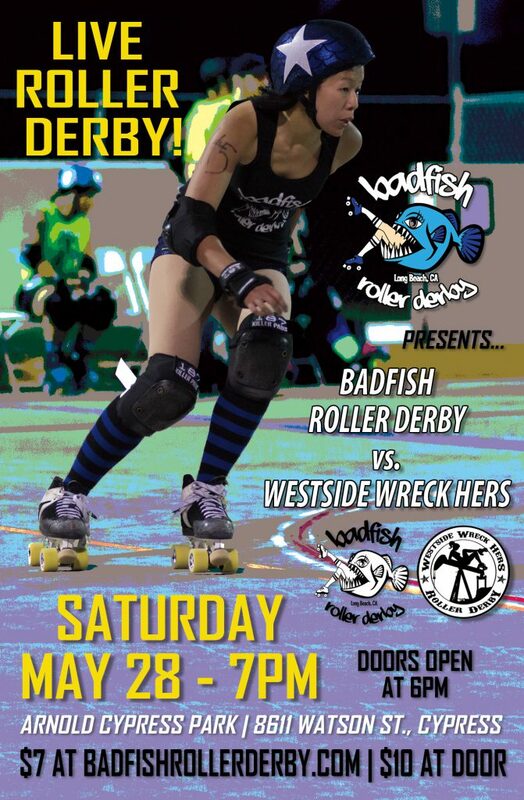 Badfish Roller Derby Home Bout May 28th! Get Your Tickets Now! 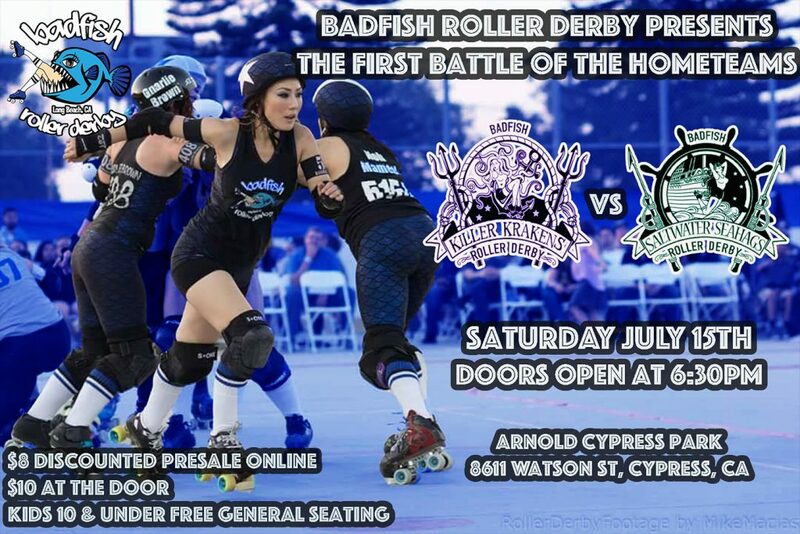 Your favorite Southern California roller derby team… Badfish Roller Derby are back at it again! This month we will host the Westside Wreck Hers at our home rink in Cypress, California. The action starts at 7pm next Saturday, May 28th! Click here to buy tickets or click here for all the details on Facebook! Want to play roller derby? Come to our Recruit Night in Long Beach! Have you ever wanted to play Roller Derby??? Now here’s your chance. Badfish will be hosting a recruit information night at Cirivello’s in Long Beach. April 15th Friday night, 7:30pm. Come and meet the gals of Badfish and have any questions you have about Roller Derby and the league answered. We will have raffle and door prizes. Currently recruiting woman for skating 18 and over and woman/men 18 and over for ref crew, NSO, or volunteers. Click here to RSVP on Facebook or visit our events page for more details!